My second stop of the morning was to finally meet Ruthie Davis in person. I will be doing a separate blog on her, but it was pure luck she was in town. My original interview for Raine Magazine about a year and a half ago had to be done by Skype which is okay, but there is nothing like meeting someone face-to-face. I managed to catch her 3 days before she headed to Italy, so obviously a meant to be. I also managed to pop by the Metropolitan Museum of Art for a few hours. While having a walk through at the MOMA and the Guggenheim worked out okay - I was totally overwhelmed here. There is absolutely no way to walk through and absorb anything in a couple hours. Lesson learned. Next time I will organize at least a half a day twice during the week I am in NYC and will probably look into the guided digital tour at least one of those days. What was really fun was the sheer number of people on the steps outside. The centre right and left section of stairs held people listening to a musician on one side and a singing group on the other. Only the middle section or those on the far sides were open to get into the museum The other thing I loved were the two older men sketching in the Greek section. Now for where I started my day - The Museum at F.I.T. 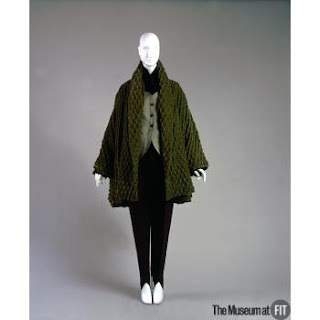 This amazing museum's permanent collection includes 50,000 garments, textiles and accessories from the 18th century to the present. Amazingly, it is also free to the public. Anyone interested in textiles and fashion could spend a long time here. 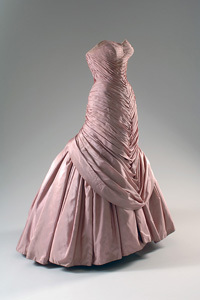 There was so much to see and today I only had limited time, so chose the special exhibition - Fashion, A-Z, Part Two. 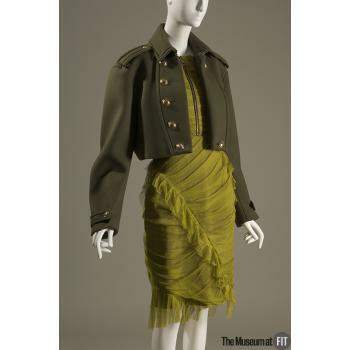 This is the second in a series that highlights modern and contemporary pieces from the museum's collection with over 60 garments and accessories. 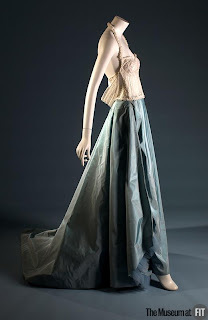 Of course there were many very famous designers the average person knows by name, but I found several others that interested me, so thought if I could find photos of the garments it would be fun to do a brief overview of some of the less commonly mentioned ones. Yohji Yamamoto (left) - This award winning Belgium designer made his Paris debut in 1981. He is among the master tailors whose work is considered "genius". Yamamoto is known for both an avant-garde spirit in his clothing as well as creating designs far removed from current trends. Martin Margiela (right) - This Belgium designer has freelanced and also worked under Jean Paul Gaultier, was the creative director of Hermès and was a member of the radical Antwerp Six. He launched his own label in 1989. 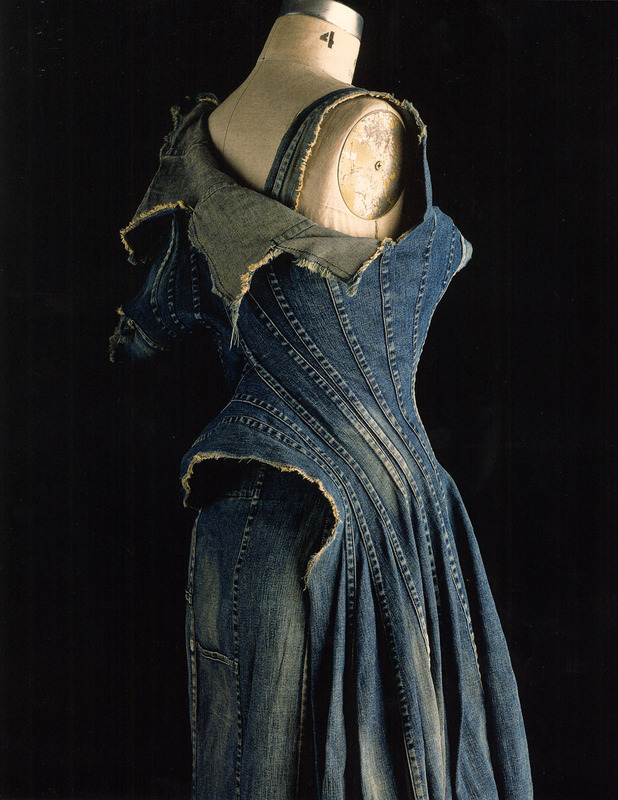 Margiela famously redesigns by hand objects such as old wigs, canvases and silk scarves, turning them into couture garments. Lamine Kouyate of Xuly.Bet (left) - Kouyaté moved from Mali to Paris, France around 1986. 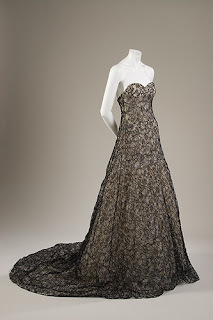 He launched his first collection 1989, when he fell in love with the Parisian fashion scene, while studying architecture. The designer's knack for recycling flea market finds and patching them together with an African sensibility is what has brought him to mainstream recognition. Charles James (right) - In a a 50-year career this talented designer made fewer than 1,000 dresses so they are very rare and FIT has managed to secure 40. James was America's first couturier and is considered a master of cutting. 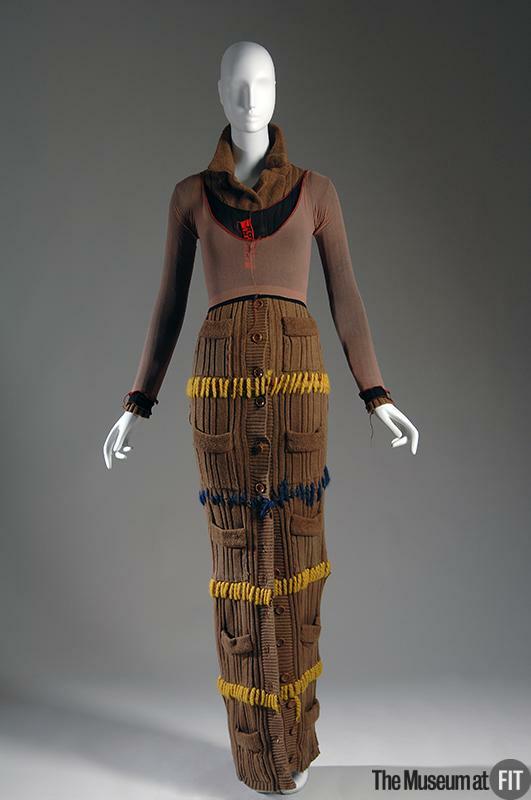 The designer is known for his highly structured aesthetic and intricate construction - seen in this "TREE" dress from 1955. Olivier Theyskens (left) - Theyskens launched his first collection in 1998. This designer's garments have a dreamlike, ethereal quality that sometimes borders on the dark. He embraces technique, attention to detail, and a romantic passion that seems to conflict with today’s profit-driven fashion world. Currently he is also director of THEORY. Claude Montana of The House of Montana (right) - Known as "The King of Shoulder Pads," this award winning designer presented his first collection in 1981 and later proved to be a leading force in leather. In addition to his own label he has designed for the House of Lanvin and Complice. His powerful, innovative designs have not always create financial success. Paco Rabanne (below) I am going to have to go back and look. FIT shows the garment on the left as what is in their collection, but I thought it was a shorter version like on the right, so you get both. Rabanne was an architectural student when he developed an interest in fashion. 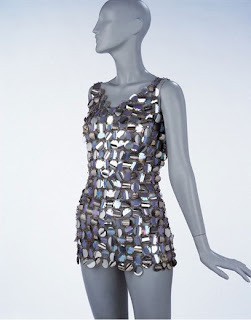 He began to design unusual buttons, embroideries, accessories, and jewelry in the 1950s. 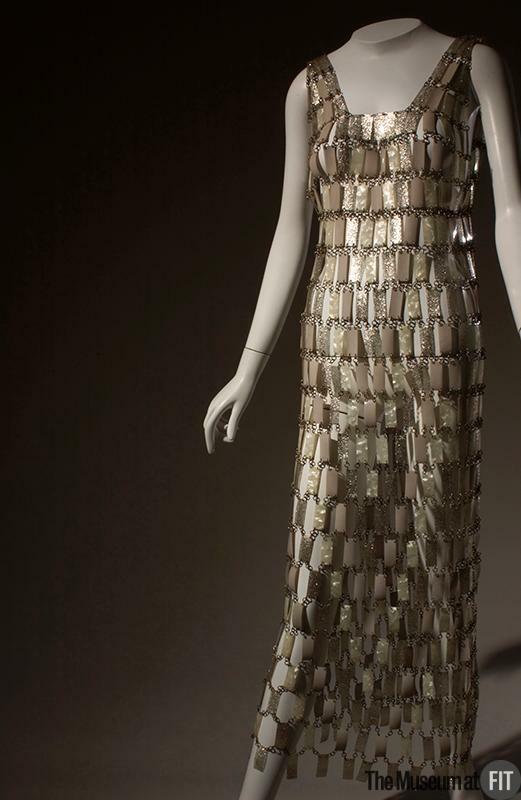 The modernistic plastic and metal materials used in his jewelry provided inspiration for his fashions. Later work incorporated metal discs, paper, leather, rubber, and even fabric, adding new textures and shapes to his signature chainmail technique. Rick Owens (left) - Owens launched his label in 1994 and did his first runway show in 2002. His award winning work has been described as "glamour-meets-grunge" - sensuous and moodily beautiful garments, draped jersey dresses and leather jackets. That said, his garment here is very structural and almost futuristic. 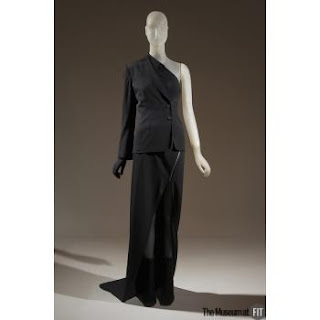 Ann Demeulemeester (right) - First I want to say this terrible photo of what I found a really interesting garment - SAD! This Belgian designer's work features austere lines, monochromatic tones, and Punk edginess - subversive sobriety and romantic allure combined. 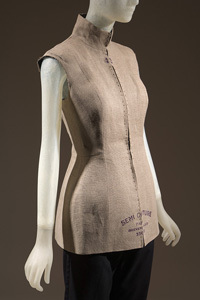 Gender is a recurring theme in her collections - a flow of masculine and feminine elements permeates her work. 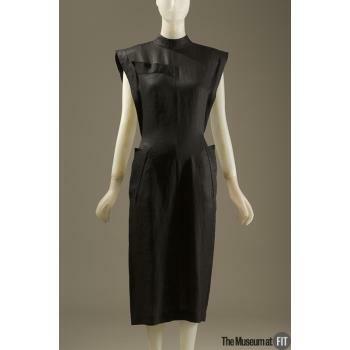 She was also a member of the Antwerp Six, a radical group of Belgian designers in the 1980's and 90's. Hard to see in this photo but here is a silver, assymetrical zipper on the skirt from the waist to mid-thigh then the skirt splits open to end in a rectangular train in back. Gianfranco Ferré (left) - Known as the "architect of fashion," the designer actually started out studying architecture before he began to design jewellery, accessories and women's wear in the early 1970's. Ferre demonstrated his expertise with form by using a simple white, man's shirt as the basis for a series of spectacular transformations in each of his couture collections for women. Displaying a wide variety of textures, shapes, and details, they were masterful showpieces in their elaborateness and intricacy. Romeo Gigli (right) - Gigli rose to fame in 1986 with soft, body-hugging dresses with draped bubble skirts," His romantic shawl-collar necklines, gentle shoulders, bandeau-swathing and cocoonish, undulating silhouettes promised to be the longed-for antidote to power suits and shoulder pads. His penchant for fitted, skinny trousers even kick-started the great leggings contagion of the early 1990s. Burberry (below) - Most of you know who Burberry is and if not you can click on the link. They are known for their coats in particular. I included this photo as I had no idea they did soft floaty chiffon dresses. Jun Takahashi of Under Cover - Takahashi has been called “the essence of Japanese cool” and “a powerful new fashion force. He sometimes explores the dark side of fashion in a way that is both disturbing and romantic. 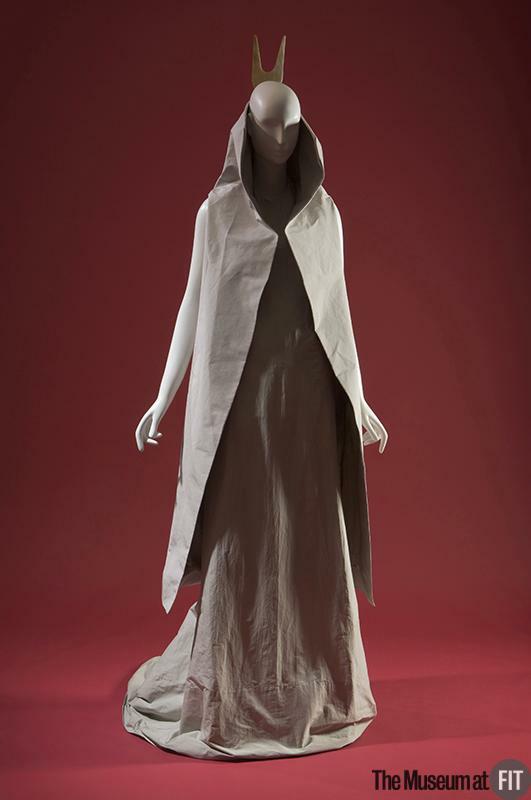 Following in a line of Japanese avant-garde designers, his designs transcend classic notions of beauty. Noir - Danish fashion label NOIR is known its sultry high style, but it is also gaining recognition for its focus on ethical and environmental concerns.NOIR partners with the textile manufacturing company Illuminati II, which provides certified organic cotton from Uganda. Workers are treated well and paid fairly, and the boost that NOIR gives to their economy provides such basic necessities as medicine and water wells. In closing I leave you with a picture I took while limping across the Brooklyn bridge about an hour before sunset. Pics are not easy to compose on this bridge - about of 1/3 of it has side barriers up and most of the places you can shoot are criss-crossed with cables, so decided this shot up one of the supports was the best.